Anton Gorodetsky is a soldier of the Light. He’s an Other: able to tap into the magical world and wield its influence on the humans around him. He lives in Moscow, takes the subway, straps on his headphones for trips across the city; on the surface, his life is still normal. But it’s not: he lives beneath a family of vampires, has a co-worker who’s a shape shifter, a boss that overhears his spoken name even when they’re miles apart, and at any moment he can step into the perilous Twilight, where he can see the deeper layers and full truth of his surroundings, but staying there too long can trap him there forever. 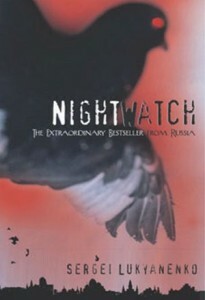 Anton’s the central character in Night Watch, a Russian urban fantasy by Sergei Lukyanenko. It’s a melancholy book that sneaks up on its readers. The novel is divided into three sections that have their own miniature plots, but that all build up to an overarching arc. Foundations for it are quietly laid the whole way through the book, making the readers’ journey mirror that of Anton’s. Most fantasy novels about the struggles between light and darkness are given an epic scale. Protagonists are the chosen ones who beat back the encroaching hoards and defeat the ultimate evil. In Night Watch, that’s already happened. The grand battle between good and evil has already been waged; each side has had its own victories and defeats. The Powers that Be decided that the time for fighting was at an end, and now light and darkness are forced into a check-balance relationship, each monitoring the other to maintain the status quo. Each side wants to gain the upper hand, to throw off the balance they’ve been forced for decades to maintain. Now they play a long game, engaging in a secret, stealthy war. They must hide their machinations not only from the other side but from their own: from the generation of new recruits trained in the concept of balance and who are more or less chess pieces. Anton is one of these. He’s an agent of the Night Watch, the Light Ones who patrol the streets at the time when darkness is at its strongest, to prevent it from gaining more than its allotted influence. The events that happen to him through the course of the novel are not random, nor are they the result of the Dark Ones maneuvering for more power. Instead, Anton discovers that he’s being manipulated by his boss, Boris Ignatievich, to set the pieces in place for a play by the Light that could gain them the upper hand against the Darkness. Anton’s little more than a pawn; the book is about him learning that he is one, one the boss is willing to sacrifice, and about him fighting back. Anton will never be more than a bit player. He can aspire to more power than he originally thought, but his name will never grace the register as one of the great sorcerers. The one thing that sets him apart is that he tries to make his own destiny. But he doesn’t do so to make his own contribution, because he’s discovered the true or best way to beat back the darkness. His interference in his boss’s plans could very well cost the Light the victory to which it’s been striving. Just like any other Night Watch agent Anton is desperate to infuse the world with Light, to see a lasting victory for the forces of good. He ends up working to prevent the blow the Light is trying to strike for his own, at first petulant, reasons.